Gathering for a retreat conference – Mother Benedict, Brother Leo, Dom Innocent. Thursday 1st. The eagle cried this morning, such a pure sound, as though from elsewhere altogether. Today is our monastery’s 116th anniversary. Will there be a special cake for 120, or perhaps the 125? Today was nice, we had the chance to talk to Mother Benedict during lunch. Bede filled us in on how nice it is to bicycle in her country, the Netherlands. Friday 2nd. Geothermal heating work progressed well this week. Problems were sorted out concerning one of the pumps, also a Freon leak will be arranged; also a new, replacement heating unit was installed in the refectory. Saturday 3rd. The guest house is alight with guests, and the feeling of different people’s homes being in one place for a few days. One of the best books we’ve had for refectory reading was “Having Our Say”, the memoirs of sisters both over 100. And now Jimmy Carter’s book has something similar about it simply because of his advanced age. Memories have been filtered decades longer, and a simplicity and sweetness step out here and there. Sunday 4th. The power went out last night, Steve had to go downstairs and switch on the backup generator. In the afternoon, he had to bring diesel fuel over to the generator tank. High winds felled some tall trees here, and the squirrels were quite happy, guess they found some treats, they were less timid than usual around humans. 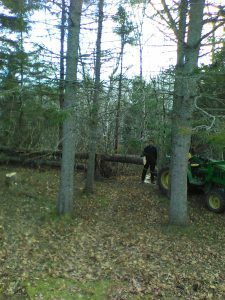 Clearing up the fallen trees – Brother Stephan. Monday 5th. The annual retreat conferences for 2018 are twice a day, directly after Lauds, then at 4:20 PM. In between, Mother Benedict crosses the tracks to also give the retreat to our Sisters. The days inevitably bring to mind past retreats, and retreat-masters: their way of speaking, their way of living. Tuesday 6th. Today, Mother Benedict spoke of Stabilitas, drawing at times on T.S. Eliot’s Four Quartets. There are roofing scraps on the lawn, left there by high winds last weekend. Wednesday 7th. The change in hour was something our digital bell clock controls handled by also giving us a minute extra, welcome particularly when we gather for prayer. Brother Glic was in good cheer today as, not without perplexity, he wondered as he wandered: where had the yellow mop bucket gone? Thursday 8th. The heating system gurgles and clicks. Sounds a bit like being on a boat. In her conferences, Mother Benedict looks in depth at the basics of our life, elements such as community or humility. As she speaks, you can feel the silence in the room change little by little, as interiorly we turn a corner. Friday 9th. Simone our cook has been cooking meat pies in advance for Christmas season. Intermittent gurgling and swishing sounds from the heating system have taken on a new élan, giving the house something of a tropical feel. For sound, that is. Unfortunately, the heating system gave out, and through a window at Compline, we could see technicians climbing ladders, at work again, successfully. Saturday 10th. Today is the 80th anniversary of the passing of Calvaire founder Dom Antoine Piana. In the course of her conferences, Mother Benedict referred to different transitions in her life: entering the monastery; becoming Superior; moving on from having been superior. 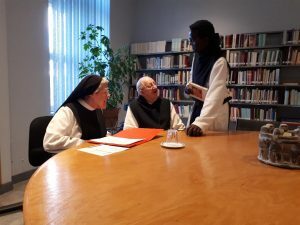 She spoke of the importance of a sense of humor in the spiritual life, and the retreat was a moment where reconnecting through humor was possible, simply because of the seriousness of the subject matter, the challenge of taking on board such a presentation. Sunday 11th. Mother Benedict and Father Innocent joined the Sisters for lunch today. Monday 12th.The sun setting earlier sends a pretty light from low on the horizon, making the outside speak in a nice way, visually. Today, work was being done to tidy up debris from the fallen trees, which have been stacked as cut by Brother Stephan. The rows of trees lining the front drive are where we lost these to the wind, but if anything, the spot might look better with a few less trees. Tuesday 13th. Benedictine All Saints’ Day. Prayer is slightly different, when it celebrates ‘anonymous’ as well as all known saints issuing from our endeavour, exactly what we’re called to. Wednesday 14th. Unseen birds flew past the chapel this morning, and the sun cast their silhouette on the partly-opened blinds. A friendly neighbour was by today with his tractor, to help transport the felled trees. Brother Glic was polishing the altar vessels today. Thursday 15th. Our friendly grocery delivery person was by today. After Lauds, there was an impromptu photo session in Chapter with Mother Benedict. This was also our chance to say goodbye, before her travel to the airport this morning. She was able to meet our Brother Henry in Dieppe shortly before her flight. Friday 16th. There was a hint of dawn’s light this morning just before Lauds, so beautiful. The dairy barn is also there to the east, and its darkness through the night still makes it feel a bit as though we’d switched planets somehow. Saturday 17th. In town, an unusually (for us) slick billboard is up on the lawn next to the Church: Rogersville will be one of the hosts for the Acadian Congress next summer. On the billboard, one sees a happy family taking it all in. Brother Stephan was out before dawn this morning with the snow-blowing tractor. Sunday 18th. Our lumberjack friend was by, and I just missed asking him what sort of winter we’ll have, according to signs he’s picked up from inside the forest. On the floor where our rooms are, all is quiet for much of the day, the one exception being tiny beeps that mean someone is adjusting the heat in their room, using the remote. Mass today had a good feeling to it, with a nice mix of people in attendance. A lot of devotion. Monday 19th. This morning, a line of geese flew by, not high above the horizon, silently. Hard to say when their migration actually takes place. The lake is white except for curves of brown near the water’s edge. Brother Leo’s reservation book is white, also, on many pages, as bookings slow down for winter. Tuesday 20th. Standing by a window on the ground floor, you feel a bit of cold, and the air is slightly fresh. All the windows on this floor will have to be replaced one day. For now, happily, all the glass is intact. Wednesday 21st. A trucker was parked on the Village Platte Road today, he’d had to re-secure his huge load of timber. The provincial archives advisor called to reschedule a visit. Recently, snow forbade her travelling. It has been 18 years since archivists worked on our files, documents and photos going back more than a century. Thursday 22nd. The latest audio book for refectory is “1491: New Revelations of the Americas Before Columbus”, by Charles C. Mann. It combines history and science, and is striking. When civilisations meet, our fragility comes out, our potential as human beings, also. Brother Stephan and Brother Glic removed contents of the oil heating furnace room: equipment which had become obsolete with the arrival of geo-thermal heating. Using the tractor Steve pulled the big oil tanks up the basement stairs and out of the building. Part of the idea behind clearing things out is to recuperate the room for other use. Friday 23rd. A lumberjack’s mother informed us this week that, according to traditional lore, a winter that has begun as cold as this one has, will not prove very cold in the long run. Winter has ‘broken its neck’ is the expression, for cold having arrived early. Saturday 24th. Brother Stephan got stuck in the snow with the farm pick-up, and today towed the truck out using the big tractor. Father Innocent has posted a chart showing our timelines as people and monks. For such a small group, there is some interesting diversity; like a monk seven years older than a monk seven years older than another monk. Sunday 25th. The eagle was on its perch a long while today, motionless as though it didn’t see the need to ever move again. At lunch, we listened to a CD of Father Lucien Deiss’ religious music; creative and authentic. Monday 26th. 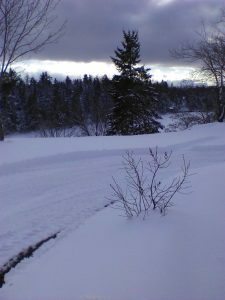 A retreatant from a neighbouring province wrote to share the peace he experiences with winter weather’s arrival. I guess that’s the wise way to take it. Today it was time to take our late-model truck to Miramichi for electronic diagnoses. The dealership there has just been renovated and on a sensory level, it is slick with state-of-the art design; a make-believe portal to what having a new vehicle can mean. Tuesday 27th. I spoke on the phone with Father Clovis, now retired as Chaplain to the nuns. His voice was musical as ever, and he was in great spirits. The verdict on the truck was, some more minute diagnoses at a later date. In Chapter this morning, Father Innocent reviewed statutes of our Order, along with other documents which serve as a guideline for our life. Returning to the voice of experience so expressed, one remembers figures we’ve known; monks, others who touched something true on a spiritual, or community, or Church-awareness level. Wednesday 28th. When there is less snow, the tractor snow-blower is able to move more quickly, the side spot light showing the barn, the crosses in the cemetery. A slide show in the pitch dark. Thursday 29th. At the Sisters, weekly chaplains are greeted by chickadees, squirrels, jays, thanks to the sisters’ bird feeders, and an unusual placement of large trees just outside the door. Brother Glic was decorating the refectory this morning in preparation for tomorrow’s special event. Friday 30th. We had our annual meal with the employees. Some of them attended Vespers, then downstairs we went to a lovely turkey dinner prepared by special guest cooks. As years pass, new faces appear; someone we had not seen in a long time will reappear. Memories, thoughts of still other people are shared, and reflections, laughter. Joy would be I guess the common thread from year to year.